Precious Moroccan argan oil with 4 other wonder oils. With vitamin E infused bursting beads.Transport your mind and indulge your senses to the warmth of Morocco with this Moroccan Spice Bath & Shower Collection, infused with a unique Argan+ Synergy, rich in nutrients and vitamins. Nourish and cleanse your skin with this exotically scented body wash. Infused with Moroccan Argan Oil and Vitamin E beads, which burst on contact with the skin, this luxurious body wash leaves skin feeling softer and smoother. 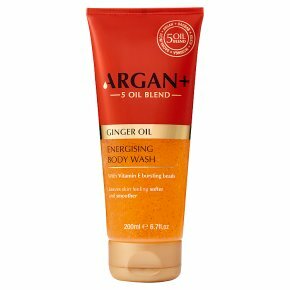 A Moroccan Spice blend containing natural extracts of Ginger, Pepper and Cinnamon, further help to pamper and nurture skin. Argan+ Synergy Argan + Synergy is an all-natural 100% blend of precious Moroccan Argan Oil with 4 other amazing oils: Baobab, Kukui, Moringa and Sacha Inchi, all selected for their restorative, regenerating and nourishing properties.